My absolute favorite thing about the summer is the fresh homegrown tomatoes. I can't get enough of them. Last year I had 19 tomato plants in my garden. This year I hope to have at least that many, if not more. I love them fresh off the vine, in between two slices of bread, made into salsa, eaten with a dash of salt and a little balsamic vinaigrette, added to numerous dishes--I even like them grilled. At our family get togethers there are two plates of tomatoes. One for me and one for everyone else. No joke. Therefore, I always get a little sad this time of year since I haven't had a homegrown tomato since late October (I refuse to buy store bought tomatoes) and know I won't have one again until Julyish. 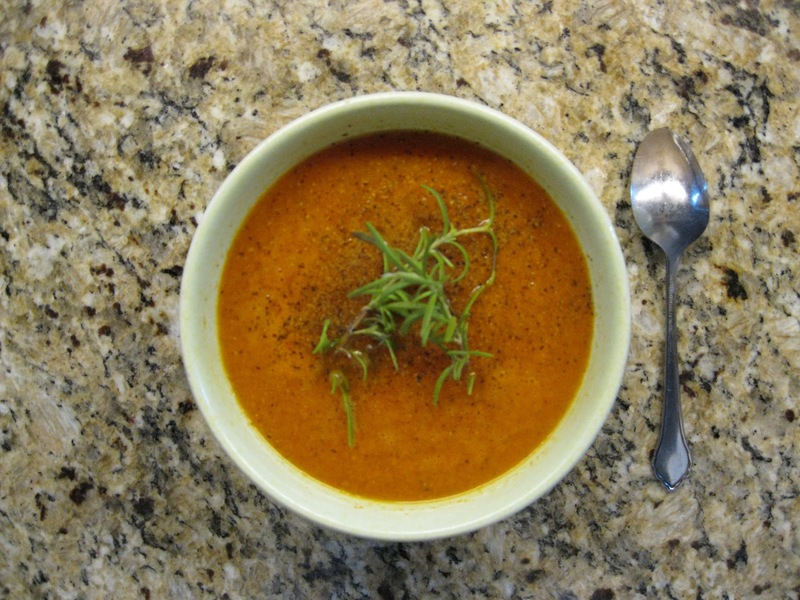 However, two summers ago I found a fresh tomato soup recipe that lets me extend that homegrown tomato taste well into winter. I make it in large batches and freeze it in various size tubs. Whenever I want that fresh tomato taste, I just thaw out some of the soup! Campbell's hasn't got anything on this recipe. Honestly, I've never added the cream so I can't tell you if it's good with that ingredient or not. I like to let the taste of the tomatoes shine and cream would just gunk that up. I let the soup cool down a bit and then use a stick blender and puree the soup right in the pot. Once it's completely cool I add it to the containers and place it in the freezer for later use. Thaw and add a grilled cheese sandwich and you've got a tasty dinner on those cool winter evenings.